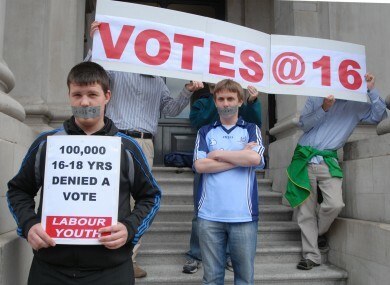 THE GOVERNMENT IS planning to hold a referendum on whether the voting age should be lowered from 18 to 16. Youth groups have argued that allowing 16-year-olds to vote in local, national and European elections would give young people a greater say in decisions that affect their lives. Opponents argue that 16-year-olds are too young or may not have enough information to decide who to vote for. The majority of countries allow people to vote at the age of 18 although a small number have already lowered the age to 16, including Brazil, Argentina, Austria and Estonia. So today we’re asking: Should the voting age be lowered to 16? Email “Poll: Should the voting age be lowered to 16? ”. Feedback on “Poll: Should the voting age be lowered to 16? ”.